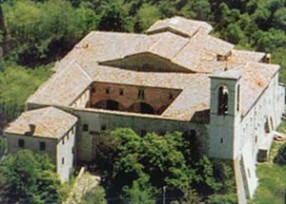 The Basilica of St. Ubaldo has five naves and was restored in 1500 by the Canonici Regolari Lateranensi to whom, the guard of the sanctuary was entrusted. Remarkable are the marble altar and the windows decoraded with episodes of the life of the Gubbio Saint patron, whose immaculate body is exposed in a crystal urn over the altar. The doors finely carved, as well as the fragments of frescoes on the walls of the cloister still show the ancient beauty of XVI century decorations. At the inside, in the right nave, the ceri are stored from the evening of May the 15th of every year until the first Sunday of May of the following year.